When meeting a professional you typically don’t have much time to make a good impression, so you have to make it count. 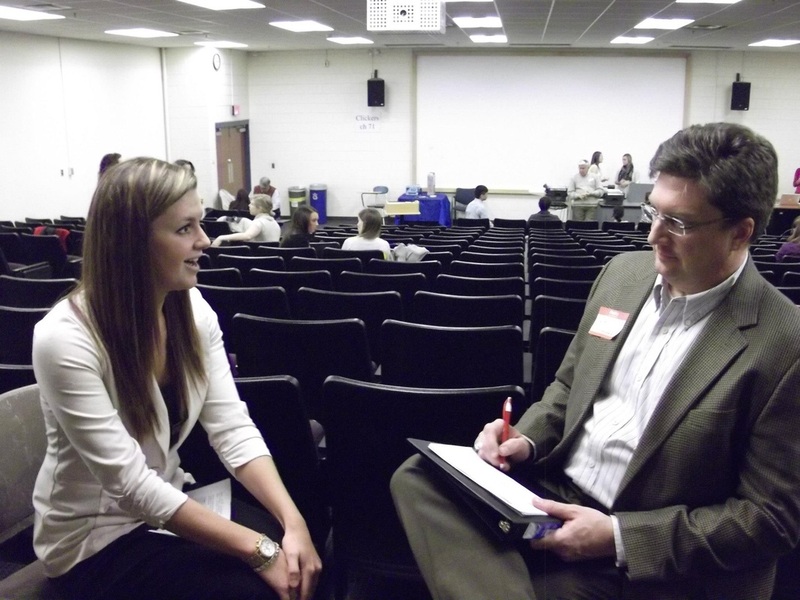 ISU PRSSA hosted a speed networking workshop so members could familiarize themselves with the experience. Ten professionals were invited to the Chapter meeting to evaluate members on their elevator speech, which is also called a 30-second commercial or pitch. 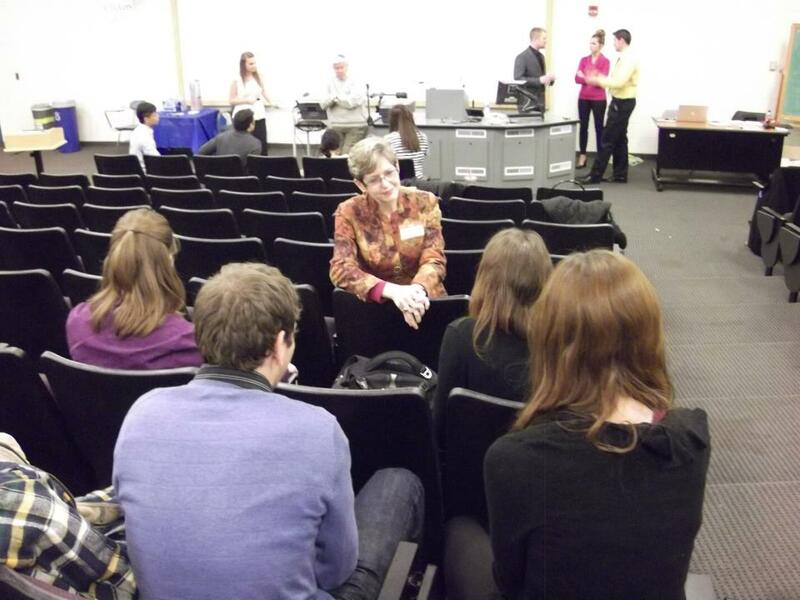 At a previous Chapter meeting, members drafted a 30-second pitch, which can include academic history, job or internship experiences, and other unique skills, honors, or awards. 1. Be conscious of nonverbal ticks and habits. Many members had the tendency to play with pens and papers while speaking. 2. Practice in front of a mirror or with friends so your speech sounds natural. 3. BE CONFIDENT! Maintain a strong handshake, control a shaky voice and avoid playing with your hands while speaking. Keep in mind that you probably won’t recite a full 30-second pitch to a professional. More than likely you’ll work in pieces of the pitch during a conversation, which is more natural and why it’s important to practice the things you’d like to convey so you’re ready. Remember to always maintain professionalism and be prepared for future networking! In honor of Thanksgiving, we asked our members what they're thankful for. Thanks to everyone who added their comments! Heather Van Buskirk: I am soooo thankful for my loving and supportive friends and family :) and my warm bed. Klauds Stachura: Mine's simple: I am thankful that I have a family. I hear of so many people that don't have a place to go on Thanksgiving because they are alone. Likewise, I also see people fighting with their family. It's sad that they do not realize that family is the most important thing. Fortunately, I have a family that is very caring and super close. I am thankful for all the family parties where we get to share laughs and memories, especially on Thanksgiving! Lisa Crocco: I am extremely thankful for my wonderful, supportive and loving family and friends. I am thankful for the opportunities that I have received this year. Obviously I am also thankful for the incredible PRSSA-Illinois State University Chapter we have. Kaitie Ries: I'm thankful to be on an e-board with so many amazing people, to have a faculty adviser who constantly goes above and beyond and to be part of a Chapter with such ambitious and hardworking members! And of course, the three F's: family, friends and food! TJ Syndram: I'm going to second Kaitie's post but add freedom to the "F's." I'm also thankful for a committee that is willing to put extra work over break! Everyone's passion and dedication to excellence is paying off in huge ways. Thanks all! Allyson Corona: Being a Redbird! So thankful for all I have learned at ISU and all the amazing people I have met along the way. Jennifer Novoseletsky: In addition to my own family and wonderful friends, I am extremely grateful for being a part of so many other families: the ISU Redbird family, the PRSSA-Illinois State University family and The Daily Vidette family! 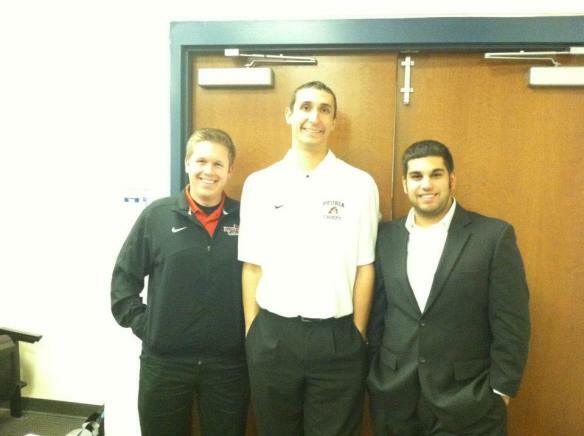 I love having so much support and being able to work with such great teams all around! How many times are you in an elevator with your dream employer? More than likely, not many times at all. However, if that rare opportunity occurs, you’ll obviously want to be prepared. 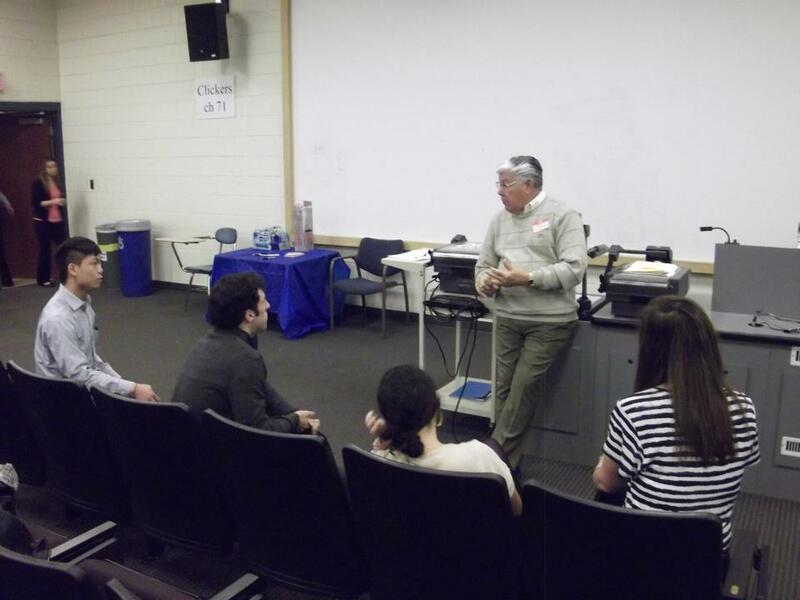 At Chapter, members learned how to create a 30-second elevator pitch. Luckily, delivering a personal pitch is quick and easy, if you take the time to prepare and practice. After all, talking about yourself should be a subject you’re knowledgeable about! 1.) Start by introducing yourself: include your name, year in school, the school you attend, and your major or minor. 2.) Discuss any internships and work experience you had in the past and briefly state what you did for those organizations. Also, don’t forget to mention any leadership positions you have held. 3.) Discuss any current (or past) leadership positions you hold, awards you’ve received, and any achievements you’ve been recognized for. 4.) Discuss your future plans and how you could be an asset to his/her company. 5.) Wrap up your pitch with asking to exchange business cards or even asking to connect on LinkedIn or other social media platforms. Most times, you will not be reciting a straight pitch, but remember to include these points in casual conversation. Practice, practice, practice. Remember, practice makes perfect! Practice in front of the mirror or even record yourself. It is important to realize your nervous ticks. Avoid raising your voice at the end of sentences or talking in monotone. Try to speak as naturally as possible. Good luck and have fun creating your own 30-second elevator pitch! What made you decide on the PR major? Our members weighed in. Maggie Ziemann: I first began following a path for journalism and quickly realized it wasn't for me and what I wanted to do the rest of my life. When I discovered what PR was and all the fundamentals of it I knew that it was what I wanted to do for the rest of my life and fit my personality and the skills and strengths I have. After joining PRSSA, doing more research, getting real hands on experience and taking COM classes here at ISU I have fallen in love with PR and my passion for it has grown. Cody Walker: I decided that PR was good for me because, I see the value in having a strong connection between an organization and it's audience. By increasing that connection across multiple channels; people, products, and services will continue to grow in a way that benefits everyone. Heather Clayberg Kellog: Simple really-- combined interest in writing and speaking mixed w/ a natural social skills. My hatred for math played a toll, too. Also a JOURN turned PR major! Kaitie Ries: I always wanted to be an author when I was younger, so PR is a perfect fit because it allows me to write a lot. I also love the relationship building aspect and working on a team. Lisa Crocco: I loved journalism but knew that I couldn't do it every day for the rest of my life. I looked for careers that still involved a lot of writing and fell into PR. PR ended up being a perfect fit for me because I have always been fascinated by branding, image, social media, journalism and communication. Kyle Slamans: I wanted to go into PR after realizing that I wasn't able to race motocross at the professional level, and I thought being able to work with athletes and represent them on a professional level was the next greatest thing. During all of that time I got more intrigued by the application of PR in general instead of just athlete management and it has allowed me to further my knowledge and start the companies I currently own today. Deciding on PR to be the major I wanted a degree in was hands down the best decision I've ever made in my collegiate career. Kim Nowlan: At first I was going to go into criminal justice, and then go to law school, but I didn't want this to be my only option. I talked to a counselor and they recommended I look into a communications major. Once I saw PR, I thought that it was something I could picture myself doing for life. Since being in the program, I couldn't be happier with my choice. Kelsey Carey: I came to ISU as an education major because I wasn't sure what I wanted to do and my mom and sister were education majors so I thought I'd give it a try. Then Kaitie Ries took me to a PRSSA meeting a couple weeks into school and the rest is history! I applied to the school of communication the next semester and changed my major. I love all the writing and planning and social connections made through being a communication major. Joining PRSSA as an education major changed the whole rest of my life and I couldn't be happier! Bruce Kennedy: At heart, I have always been someone who loves to tell a story. Whether it is writing a press release about a product, telling your companies side of the story during a crisis, planning an event to introduce costumers to a brand or compiling research data to show the value of a nonprofit in a community, public relations about telling a story. 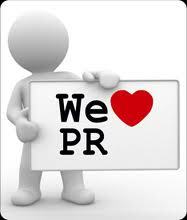 With public relations I can do what I love, work with creative people and enter a rapidly growing field. Brittany Tepper: I had no idea what I wanted to major in during my first two years of college. I changed my major about half a dozen times! I ended up spending a semester in Orlando, FL. interning at Walt Disney World. I heard they had classes for students unsure about what career path to take. While there I took a class called “Marketing You”, the first semester revolved around career placement. It is through this class that I learned about PR. 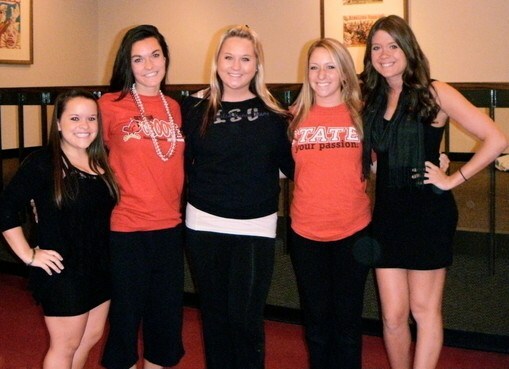 When I came back to ISU I joined PRSSA. It really reinforced my feelings about PR, and that it is the right fit for me. I love telling a good story, and the versatility a career in PR gives you. One of the simplest but most powerful statements is “thank you.” eBay, the world’s largest online marketplace, where almost anyone can buy and sell practically anything, understands the importance of a simple thank you, which is why the company recently launched the “eBay Thanks You” Campaign. They even took this campaign to every major social media outlet. Facebook shares, YouTube videos, and tweets with #ebaythanksyou flooded my social media world. Each time I see another story about this campaign, I’m excited to follow the link and read the story or watch the video. In addition to eBay thanking people for their business, it is also sharing consumers’ personal stories. I watched a video from customer, Jonathan Adler, on how eBay helped him furnish his phone. Even though it was so simple, it was well done and relatable. I mean, who hasn’t made an eBay purchase before? Part of this campaign also includes daily and weekly prizes that sellers and buyers have a chance to win. eBay also is giving away a $50,000 grant to one of three nonprofits who use eBay most effectively and are allowing users to vote to pick the winner. Not only is eBay thanking people for their business, sharing their stories, and giving away prizes, but it also is giving money to charity too. What more could you want from a company? This campaign exemplifies effective public relations in numerous ways. From praising their customers, sharing stories, enticing the social media world, giving out prizes, and donating to charity, eBay is a model for how every company should act. Dance like no one’s watching! But at ISU, many will be watching. The Unlimited Dance Team (UDT) will host an intercollegiate dance contest on Nov. 16. To support that event, UDT held a fundraiser at Pub II on Wednesday, Oct. 31. Promoting the Halloween spirit, the girls dressed in their Halloween best, set up shop in the parking lot and embraced the cold as they served up some sweet treats and hotdogs. Bags of puppy chow were sold for $1 and hotdogs for $2. ISU’s student-run newspaper, the Daily Vidette, sponsored a costume contest inside, helping draw a large crowd, which provided plenty of potential customers for the fundraiser. With help of the plethora of partygoers waiting outside, the fundraiser garnered $125 to support the team, as well as the upcoming dance competition, “Leave it on the Floor.” Teams from Illinois State, University of Illinois-Champaign, University of Illinois-Chicago, Western Illinois University, and Northern Illinois University will be competing in various styles of dance in ISU’s very own Brown Ballroom. On behalf of UDT, thank you to all of the community members who supported the fundraiser as well as the UDT sponsor, Bill’s Key and Lock Shop. For more information on recent and upcoming events, visit the UDT Facebook page or tweet @ISU_UDT. The whole team participated in the fundraiser, baking puppy chow and taking 30 minute shifts selling puppy chow and hot dogs. A great thing about our Chapter is that the executive board is always trying to appeal to the interests of members through professional development opportunities. Since many members are interested in doing PR in the sports field, a sports PR panel was planned so members could learn more. 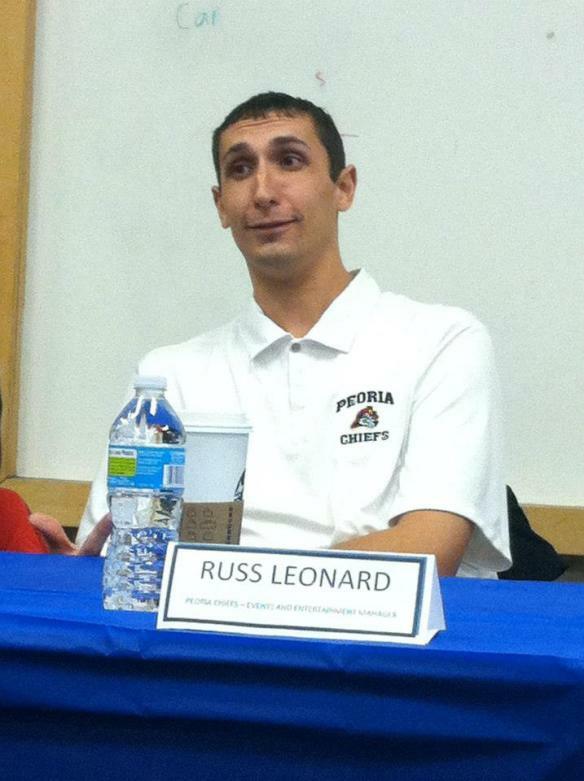 The panel included John Twork, assistant director for ISU Athletics, Russ Leonard, events and entertainment manager with the Peoria Chiefs Baseball Team and Alex Menoni, ticket sales account executive and music director for the Bloomington Blaze. The panelists began with explaining each of their positions and how they reached their titles. Sports have been a passion in each of their lives since high school and once they realized they were not skilled enough to play the sport at the collegiate or professional level, they took a different approach and became a member on the other side. In sports PR, it is about more than just the game, but more so what happens behind the scenes in creating successful events. “No day is the same,” Twork said. The sports world is small in which a lot of positions overlap. These sports professionals taught me that even though you work long hours and do not get to celebrate with the fans right after the game, it is very rewarding in the end. Twork and Leonard said that fun happens in seeing the passion and drive in the players and being able to give their players the recognition they deserve in the media. Since the sports communication industry is so small, the panelists emphasized the point that making a good impression on everyone you meet can only help you in the future. Experience is a key factor they took advantage of in receiving their current positions and was an important resource they recommended in landing a job for the future. Twork, Leonard and Menoni were great representations of the sports world and answered a lot of questions members had about what it takes to get into such a competitive field. Making connections with professionals is critical, so having guests speak to our Chapter really is a great opportunity to meet people who may be able to help you further down the road. So far, ISU PRSSA social outings have been extremely fun and a great way to get to know members of the Chapter. Recently, we went on an excursion to get in touch with the spirit of Halloween. Our first stop was Rader Family Farms. Those of us who attended bought bracelets to enter the corn maze and to participate in other activities. We had a great time walking through the cornfield, and trying to scare the rest of the group by popping out of the corn. Being at Rader Family Farms was a great experience and brought out the kid in me. After spending a pleasant afternoon there, we went to the haunted house on Washington Street in Clinton. As we walked up, there was a significant number of people already there so I got to know other members during the wait time. Seeing others get scared by the employees walking around in scary costumes and masks was really fun for me. While going through the house, I realized I was laughing and smiling more than I was being frightened but the workers were very well dressed and did creep me out a little. I also liked being chased by the “Texas Chainsaw Massacre” guy at the end. I could go on, but I do not want to spoil the surprise for those who may want to attend next year. I highly recommend attending socials as a way to get to know members on a more casual basis. One thing I know now is that while PRSSA knows how to be serious, and professional, they also know how to show its members a good time. 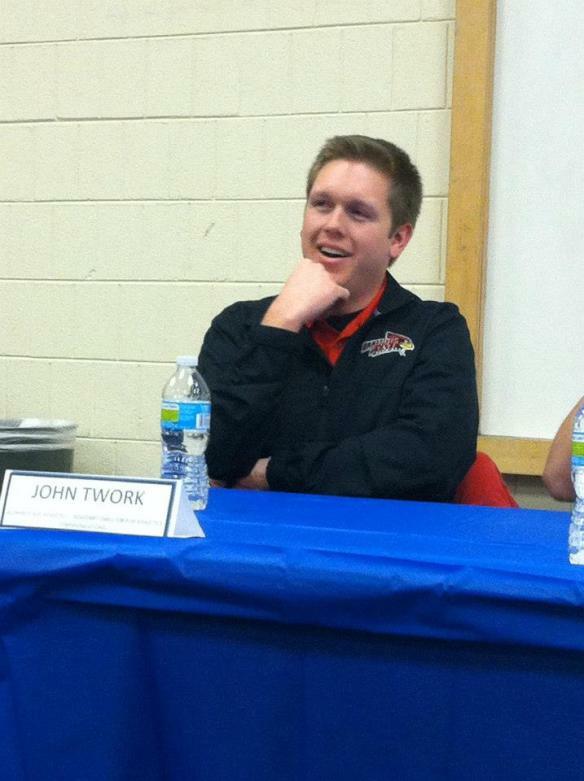 Every month, members of PRSSA look forward to hearing the big announcement of who the Member of the Month is. This award is given to the member who has earned the most Member Incentive Points (MIPs) for the month. 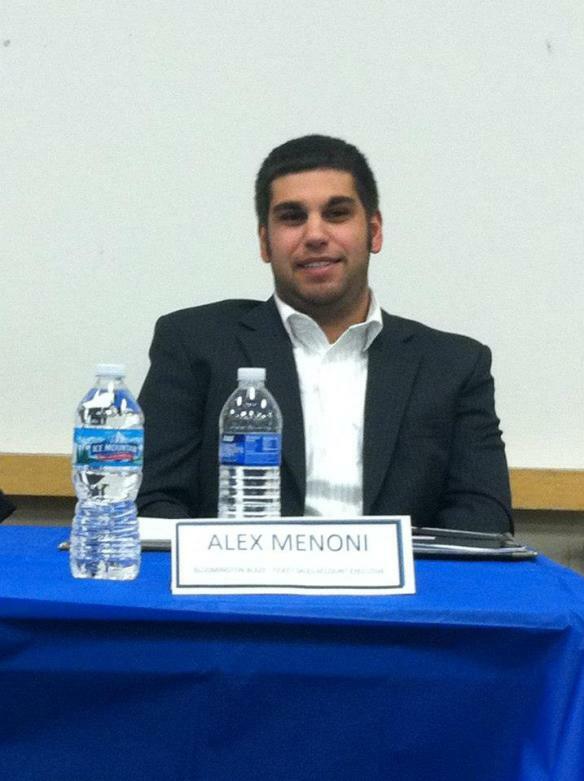 The winner is then honored and thanked for his or her hard work and commitment to PRSSA during a Chapter meeting. In order to easily keep track of your points, refer to the MIPs tracker on the blog page. Every member should strive for this honorable award because not only does it mean you’re benefitting from the events PRSSA has to offer, but it’s also a great award to showcase on your résumé. At the end of each month, the MIPs are tallied and a winner is announced. Members can only win once, so if you did not win, don’t give up! The winner receives a signed certificate (great portfolio piece) and a personalized poem written by our president, Kaitie Ries. Lastly, the person who has the most MIPs at the end of the year will be named the Member of the Year. In addition to being honored at the end of the year party, the Member of the Year is rewarded by not having to pay dues for the following year.